Gregory Liénard Blog: Google is God. Right? The average internet user will clearly point out the difference between Google and God: when asked a question (performs a search), Google will answer, and with a certain degree of accuracy. 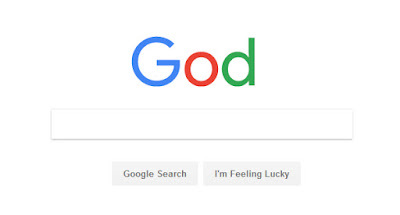 But does that mean the search engine deserves to be worshipped like a deity? A blessing or curse for those relying on the internet? People whose income relies on the internet, web shop owners etc., often seem entirely dependent on Google, more dependent than on any other higher being. Reaching new customers is defined by ranking high in the Google search results with your web shop or website. In case that fails, you are forced to use Google Adwords and can only hope those paid adverts will not cut into your revenue. In reality, Google is just like any other commercial enterprise: focussed on maximising profits rather than ‘not being evil’. However, sometimes is seems Google wants to behave like a law dictating supreme being, deciding what is ‘white hat SEO’ versus ‘black hat SEO’. Oddly enough without accurately defining those concepts. For loyal Google followers, the distinction is very clear: white hat SEO means doing what Google wants, black hat SEO the opposite. Still, the sad truth regarding the organic search results is far from poetic. Google wants the search results to be relevant in order to optimise the user experience, but it doesn’t really matter if the best, most informative and most customer friendly web shop or website ranks at the top. As long as Google gets to position a few paid adverts around those organic results, the business model is safe. SEO specialists, the most loyal of Google followers. Strangely enough, specialists in search engine optimisation often disregard this simple truth. You would expect people with knowledge of and insight into Google’s methodology to be aware of the fact that users of - often free - Google services, are not the customer, but the product being sold. Still SEO professionals believe that the – sometimes rather vague – Google guidelines, are holy scripture and that sinners should be punished accordingly. They can be regarded as religious fanatics, although Google-believers are not concerned with a fictitious deity, but a multinational with a de facto monopoly. In addition, Google retains all user information: interests, hobbies, purchases, employment, search history, personal messages though Android smartphones and G-mail accounts, etc. Cracks in Google’s monopoly: a blessing for mankind? Intelligent human beings with a basic knowledge of how Google collects data and redistributes it to paying customers, have their concerns about the company’s interpretation of privacy. They even sympathise with companies and organisations that expose and utilise the frailties and backdoors of the Google algorithm, those who try to counter Google’s monopoly and chip the varnish of self-righteousness. It makes it even harder to comprehend why exactly SEO-specialists blindly fall in line with Google’s guidelines and follow them like holy commandments, almost as if they are suffering from Stockholm syndrome. Let’s hope wisdom comes with age. Practical: How does your web shop or website reach a top ranking position in Google? Quality and optimised content is half the battle. In a perfect world, a web shop / website has individual optimised landing pages for every important keyword, which are highly valued by Google and guide human visitors as swiftly as possible towards fulfilling the purpose of the website. In reality, the page that Google ranks at the top of the organic search results for a certain keyword, is by definition the landing page for that keyword. If the optimisation of the landing page for a particular keyword is of sufficient quality, Google will position it amidst the top ranking pages. A pool which still represents 40 to 50 websites. Improve your web shop/website’s reputation for top rankings. If Google decides your website belongs in the pool of ‘best websites’, give or take the top 30 of the organic search results, the search engine will evaluate the reputation of the landing page to decide the top ranking positions. This evaluation is based on links to your website from other relevant websites. A sound reputation can mean the difference between a ranking on the 2nd or 3rd page of the organic search results and a lucrative position on Google’s 1st page.